Although dogs and cats are often portrayed as enemies, if introduced carefully, they can actually get on extremely well. That method is far too stressful, even in the best of circumstances. It’s important to keep in mind that introductions can be dangerous, especially for the cat. By letting a loose cat and an off-leash dog meet each other in an open room for the first time, you are probably setting up both animals to fail. Instead, plan ahead and take your time. For both cats and dogs, smell is extremely important for communication. You can integrate the new pet into your home more successfully by making sure that they smell of ’home’ before being introduced. You can start this process even before you bring your new pet home by exchanging bedding between the pets if this is possible. This way, they get to know a bit about each other, even before they meet. Across a few days, rotate which animal has freedom and which is confined to allow each animal plenty of time to investigate the other one’s scent. Sometimes the dog should be confined to a crate or another room to allow the cat time to roam free and investigate the smell of the dog and vice versa. When no one is home, the dog or cat must always be securely confined. Once the dog is calm or at least not obsessed with the cat and the cat is calm, eating and using the litter box normally, start making leashed introductions. If either your cat or dog appears frightened, go back a few steps and keep them apart for a while longer. Continue scent swapping regularly and try again the next day. If you keep these controlled, short meetings up regularly you should see an increase in the cat’s confidence and a reduction in the dog’s excitement as they become more familiar with each other. Next allow both animals to be in the same room at the same time, but keep the dog securely leashed. Continue with this type of introduction until the dog is calm and ignores the cat, and the cat is calm, eating and using the litter box normally. Cat food is hugely tempting for any dog, so keep it well out of the way. Likewise a litter tray can be pretty tempting too, and should be kept out of your dog’s reach. Cats need to relieve themselves in private and if your dog is able to access the litter tray easily or pester your cat while toileting, your cat is likely to become distressed and may even resort to toileting elsewhere in the house. Continue indefinitely until both the dog and cat seem relaxed around each other. Don’t forget that when no one is home, the dog or cat should be securely confined to separate areas so unsupervised interactions are not possible. When can you take off the leash and let the two begin their lives together? When the dog isn’t interested in bothering the cat and the cat feels secure enough to come out from under the bed. How long it will take to get to this step will depend on the animals involved, and you must work at their pace. Unsupervised time together can occur after the cat and dog have been supervised around each other for a significant period of time and you are positive they will not hurt each other. Remember that all pets are different and you’ll have to work at the pace that they are comfortable with. 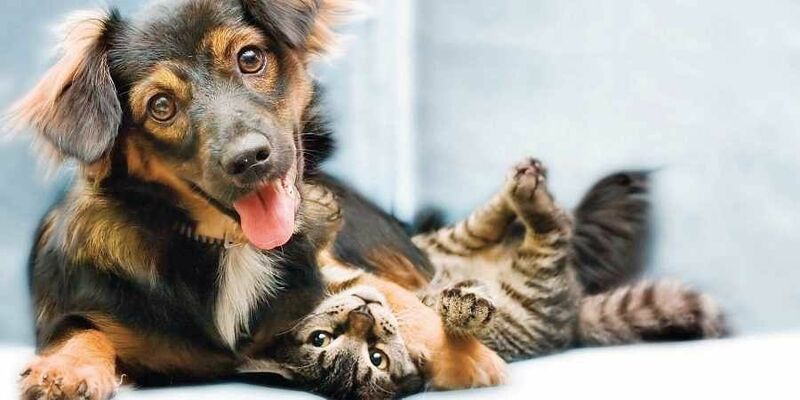 It’s not uncommon for dogs and cats to become friends and to enjoy each other’s company. Take the time to manage the introduction properly, and you could be setting up a friendship that will last for the rest of your pets’ lives.